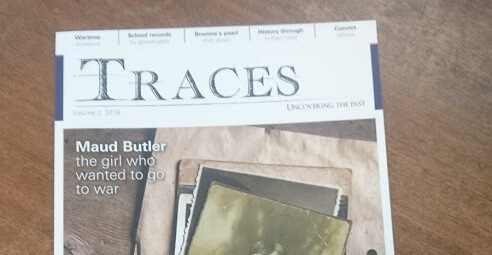 May is here, and we’ve just had the brand new issue of Australian Family Tree Connections magazine arrive in our letterbox. – and What’s on this month (events) you’ll find that the May 2016 issue is packed with numerous articles and Can You Help? queries. 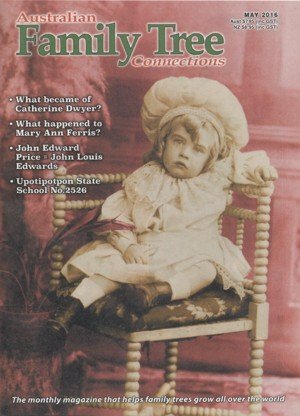 The featured articles in this issue include: The very elusive “Charles Pearce”, What became of Catherine Dwyer, Margaret Neylon: Mothers in family tree, Patricia Mary (Higgins) Dewar, John Edward Price = John Louis Edwards, What happened to Mary Ann Ferris?, The Coppin family history, Violet Day 1914 in Sydney, Thomas and Emma Reeves (Elliott), Upotipotpon State School No. 2526, John and Agnes Emily (Graham) Walker, Where do I stand legally?, and Felix O’Hare. New on the Net section features news from numerous online data websites and together with their latest additions. Issued monthly this magazine is on sale at newsagents, and family history societies around Australia (price Aus $7.95, and price NZ $8.95). If you local newsagent doesn’t stock the magazine, you can buy it direct from Australian Family Tree Connections. Subscriptions and back issues can also be purchased directly through AFTC. I am attempting to find information on the life/death of William Leonard Pritchard. born 23 December 1876. NZ. He divorced his wife Jane Coulter Jones Pritchard in 1923 and no details are known of his life after that. Possibly moved to Australia. I am a grandaughter of William & Jane. Hi Diane, The AFTC magazine is available at some newsagents in NZ … but if you can’t find it in one near you, you can always order it online at http://aftc.com.au/cart/current-issues/.